Each year the Bibendum Wine Training Team (shortlisted Wine Educators of the year) travel to a different wine producing region to gain a deeper understanding of their vines, wines and winemakers. It's mid June 2013 and the English summer is in full swing, so it's around 12 degrees when I drive through the dreary grey to Luton airport. 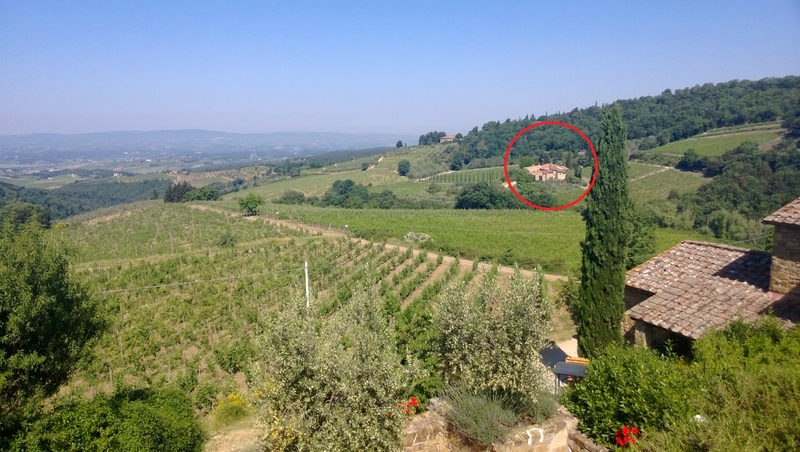 This year's destination is Tuscany where the temperatures were already hitting the low 30s. This was going to be tough (!). We packed an incredible amount into 48 hours, so I'll break this blog into (at least) five sections. A blissfully short flight sees us touch down in Pisa in just over an hour and a half. A slightly less relaxing two hours follows as I embark on my maiden voyage driving on what I firmly believe is the wrong side of the road. Eventually we leave the motorway behind us and wind our way into the twisting, undulating roads of Chianti. 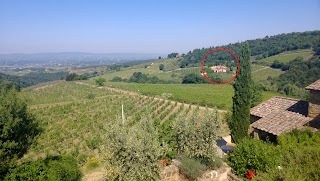 The peaks and valleys become more pronounced as we enter the historical centre of the region, Chianti Classico, making the difference between the appellations immediately obvious. Upon arrival at the delightfully rustic Hotel Colombaio (to which I firmly intend to return) we are met by Loredana Stegaru from Castellare, who drives us down to their vineyards and breathtaking tasting room - within a converted 13th century church. We are joined by Alessandro Cellai, the winemaker not only for Castellare here in Tuscany, but also Rocca Di Frassinello in Sicily. This is an honour indeed - he has flown here from Vinexpo in Bordeaux just to meet us and flies straight back the following morning (if you read this Alessandro, thank you so much!). By the time we arrive in the vineyards it is approaching 7pm. Conifers and olive trees cast long shadows over the rocky soils which make the wines produced here so distinctive. 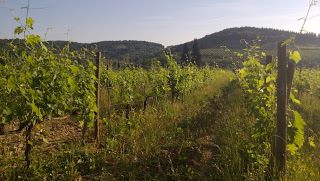 There are 25 acres planted here, of which the majority is of course Sangiovese - around 90% (actually, a clone known as Sangioveto, of which more later). There are also 2,500 olive trees which are used to produce an olive oil in the estate which I would happily drink by the glass. Alessandro explains that there are two fundamentals which underpin the philosophy for Castellare: their respect for nature and their respect for tradition. As such, they operate all of their vineyards entirely organically - no pesticides, or chemical fertilizers. 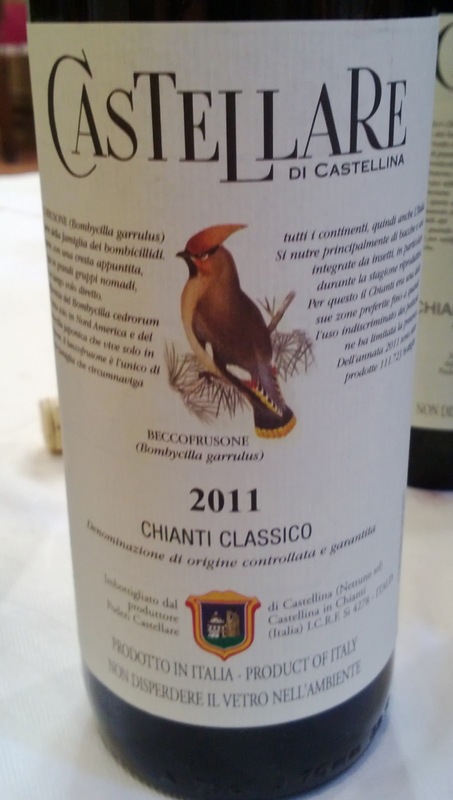 The label of each vintage is decorated with a painting of a different native bird, a nod to this obsession with getting the best out of nature. Their traditional approach is most evident inside the bottles. Though they have some international varieties of excellent quality (Wine Advocate listed their Merlot in the top 5 Merlots in the world), Alessandro refuses to include these into his traditional Chianti Classico (and Reserva) blends. Instead he leads with their own three unique clones of Sangioveto which are exclusive to Castellare and found nowhere else in the world. Added to these are small components of Caniolo. 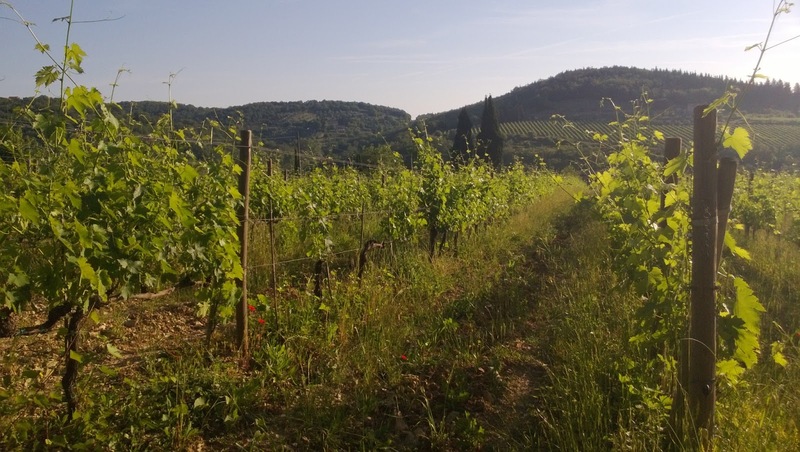 In what we would learn is becoming a trend in Tuscany, there is also a belief that complexity in wine should not come at the expense of refreshing 'drinkability'. As such, it is imperative to the style that a crisp acidity is retained throughout the harvest and winemaking process. It's fair to say that Alessandro achieves this with considerable style since all his wines have a signature freshness which it's hard to imagine coming from any other country. As if we hadn't yet been spoiled enough, we were then served dinner inside the church! Now I'm no food blogger, but this really does deserve a mention. The chef had produced some wonderfully delicate flavours using vegetables all grown on the estate. It goes without saying that the wines were all matched impeccably to the food. I'm not going to write out my tasting notes for every wine here (you should really get hold of some of them and try yourself), but there was one wine in particular which had me captivated: I Sodi di San Niccolo. As a literal translation, I'm told this translates to 'strong soil', a description of the terroir surrounding us in the vineyards. I Sodi di San Niccolo - Stunning! This blend of Sangioveto and Malvesia Nera must be tried to be believed. It's an absolutely explosive wine with hugely concentrated, complex flavours from bright, fresh cherry through to dark, vegetal tertiary notes. It has become one of Italy's most awarded wines, and it's easy to see why. Our meal wrapped up with a tiny taste of vin santo, another unexpected delight. More on that in part two. The sun slipped out of sight behind the Tuscan hills, signalling the end of our first day in Tuscany. A fantastic start to the trip, it's a genuine worry that we may have peaked too soon!